An electrocardiogram also termed an ECG or EKG (K means kardia for heart in Greek) or a 12 lead ECG. is a simple test that records the heart's electrical activity. The ECG machine is designed to recognise and record any electrical activity within the heart. It provides information about the function of the intracardiac conducting tissue of the heart and reflects the presence of cardiac disease through its electrical properties. Understanding ECG helps to understand how the heart works. With each heartbeat, an electrical impulse starts from the superior part of the heart to the bottom. The impulse prompts the heart to contract and pump blood. Some heart problems are easier to diagnose when your heart is working hard and beating fast. During stress testing i.e. exercise ECG, exercise is used to make the heart work hard and beat fast while an EKG is done. If exercise can't be done, you'll be given medicine to make your heart work hard and beat faster. Heart rate and blood pressure will also be monitored throughout the test period. It usually takes about 7 to 12 minutes to complete. determine if symptoms, such as chest pain, shortness of breath or palpitations are due to a heart problem. know steady or irregular heart rhythm. detect other disorders that affect heart function. Study and detect many heart problems, such as heart attacks, arrhythmia, heart failure. asses coronary blood flow and heart valves integrity. monitor deeply-sedated patients and for consciously-sedated patients with compromised cardiovascular function. monitor some medications for the heart. The indications for exercise electrocardiography include to ascertain the correct exercise prescription, the investigation of angina and post-myocardial infarction assessment as well as the postoperative examination of bypass surgery. To better under why there are only 10 leads instead of 12 leads read about Einthoven's triangle and the heart's action potential generation. The ECG paper is a strip of graph paper with large and small grids with horizontal axis(Time in seconds) and vertical axis(amplitude in volts). 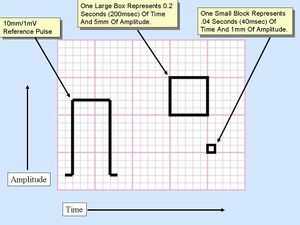 Each 1 mm square (the smallest square) represents 0.04 second and each large square (5 mm) represents 0.2 second. On the vertical axis, each large square represents 0.5mV and each small block equals 0.1mV. The procedures are to be explained to the patient and what is to be expected during testing will also be clearly communicated to the patient. 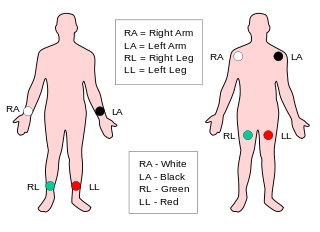 Place the 4 limb sensors on a smooth fleshy area of the lower inner forearm and lower inner legs, or upper inner arms and lower inner thighs, or upper inner arms and lower abdomen. Attach the limb leads. Before exercise commencement, the investigator will perform an EKG at a resting heart and also take blood pressure reading. At regular intervals, the lab personnel will ask how you are feeling. The patients starts the exercise at slow pace (e.g. walking on a treadmill or pedaling a stationary bicycle without resistance at a leisure pace). The intensity of the exercise will be gradually increased, until the patient feels exhausted. The patient then reverts back to slow walking pace or pedal slowly for a couple of minutes to cool down. The heart rate, blood pressure, and EKG will continue to be monitored until the levels begin returning to normal. If medication is used, an IV will be inserted in on the arm in order to have the medication administered. • P wave, QRS complex, and T wave show the 3 phase of cardiac cycle in one heart beat. Clinician should be aware that some changes in reading are commonly noted so it should not serve as a concern unless other symptoms are present to validate the supposed pathology. It is paramount to compare the current ECG with past reading if any, because any change or difference may point out an anomaly. ECG changes should be put into a clinical context. For example, ST-segment elevations are common in the population and should not raise suspicion of myocardial ischemia if the patient do not have symptoms suggestive of ischemia. P-waves should precede every QRS complex and the P-wave should be positive in lead II. 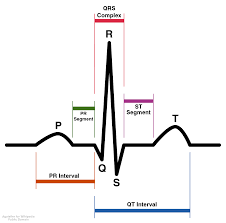 Sinus rhythm (which is the normal heart rhythm) has the characteristics heart rate of 50–100 beats/minute,P-wave before every QRS complex and positive in lead II and also a constant PR interval. Bradycardia: sinus bradycardia is seen in a skipped rhythm, Causes are second and third degree AV block, sinoatrial block and arrest termed sinus node dysfunction (SND) bradycardia and sick sinus syndrome (SSS) if symptomatic. Tachycardia (tachyarrhythmia) with narrow QRS complexes (QRS duration <0.12 second): Causes are sinus tachycardia, inappropriate sinus tachycardia, sinoatrial re-entry tachycardia, atrial fibrillation, atrial flutter, atrial tachycardia, and multifocal atrial tachycardia. Tachyarrhythmia with narrow QRS complexes rarely cause circulatory compromise. Tachycardia (tachyarrhythmia) with wide QRS complexes (QRS duration ≥0.12 second): The main cause is ventricular tachycardia and it can be life-threatening. QRS complexes become wide due to abnormal ventricular depolarization but 10% of wide complex tachycardia starts from the atria. P-wave is actually positive in leads II, III and aVF. All leads P-wave amplitude is ≤2.5 mm. All leads PR interval must be 0.12–0.22 second. A P-wave that is not positive in lead II is not sinus rhythm. Pre-excitation (WPW syndrome) seen when PR interval <0.12 second. P pulmonale is seen in amplified P-wave in lead II and V1. If P-wave not clearly visible, look for inverted P-waves, that is anywhere between the J point and the terminal part of the T-wave. Second-degree AV-block Mobitz type I (Wenckebach block) is seen if there is repeated cycles of gradually increasing PR interval until an atrial impulse (P-wave) is blocked in the atrioventricular node and the QRS complex does not appear. Second-degree AV-block Mobitz type II is noted if there is intermittently blocked atrial impulses (no QRS seen after P) but with constant PR interval. Third-degree AV-block is noted when all atrial impulses (P-waves) are blocked by the atrioventricular node. There must be at least one limb lead with R-wave amplitude >5 mm and at least one precordial lead with R-wave amplitude >10 mm; otherwise there is low voltage. High voltage exists if the amplitudes are too high, i.e if the following condition is satisfied: S-waveV1 or V2 + R-waveV5 >35mm. Look for pathological Q-waves. Pathological Q-waves are ≥0.03 second and/or amplitude ≥25% of R-wave amplitude in same lead, in at least 2 anatomically contiguous leads. If the electrical axis normal; Electrical axis assessed in limb leads should be between –30° to 90°. Short QRS duration is of no clinical relevance. QRS duration ≥0.12 second depicts left bundle branch block, right bundle branch block, nonspecific intraventricular conduction disturbance, hyperkalemia, use of class I antiarrhythmic drugs, use of Tricyclic antidepressants. 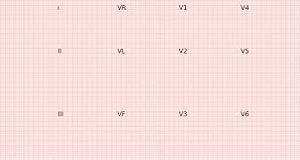 Ventricular ventricular extrasystoles (premature complexes), artificial pacemaker use which stimulates in the ventricle, aberrant conduction or Pre-excitation. High voltage noted in any leads could be due to cardiac muscle hypertrophy, left bundle branch block (leads V5, V6, aVL), right bundle branch block (V1–V3). Normal variant is noted in younger, well-trained and slender individuals. 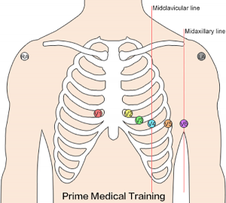 The U-wave is seen most times in well-trained individuals, and during low heart rate. It is more pronounced in V3 and V4 and three times less the amplitude of T-wave. Congenital QT prolongation seen in some form of genetic disease. Short QT syndrome is rare but usually as a result of hyperkalcemia and/or digoxin treatment, that could lead to malignant ventricular arrhythmia. Negative U-wave is seen more with heart disease. Positive on almost all limb leads and consistent with QRS complex. T-wave progression should be consistent in chest leads. 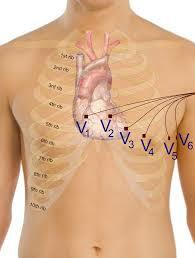 In limb leads the amplitude is highest in lead II, and in the chest leads the amplitude is highest in V2–V3. 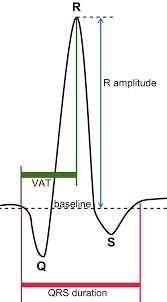 An single T-wave inversion is accepted if seen in either in lead V1 and lead III. In some instances persistent juvenile T-wave pattern from childhood in lead V1–V3 and V4. Global idiopathic T-wave inversion (V1–V6) but it is rare. T-wave inversion without simultaneous ST-segment deviation may be due to post-ischemia. One type of post-ischemic T-wave inversion is especially acute, namely Wellen’s syndrome (characterized by deep T-wave inversions in V1–V6 in patient with recent episodes of chest pain), Cerebrovascular insult (bleeding), Pulmonary embolism; T-waves become inverted in perimyocarditis and Cardiomyopathy. T-wave inversion with simultaneous ST-segment deviation depicts acute myocardial ischaemia that could be as a result exercise in case of coronary insufficiency. ↑ Kenny WL,Wilmore JH, Costill DL. Physiology of Sport and Exercise, 5th ed. Human Kinetics, 2011. 146-148.